well, the rain is back. with a vengeance. and when it comes and covers the city like this, I can't help but think about the time ava and I decided to stop complaining and take on the rain. it was june of 2010 and felt like it had been cold and rainy for months. it hadn't been, of course but it had felt like it and it was june, for pete's sake. june. we were ready for summer so we decided to take matters into our own hands. 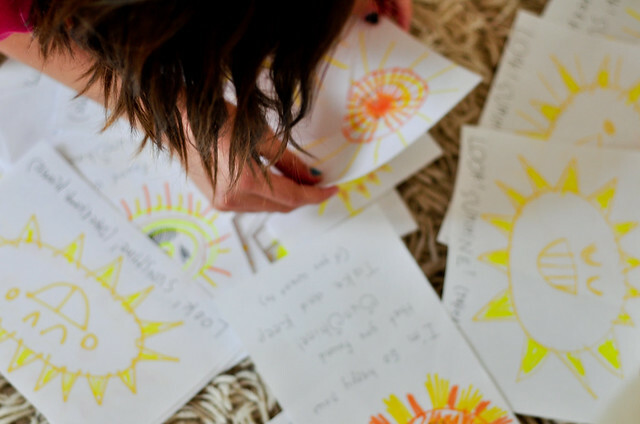 we gathered the necessary materials (white paper plus every yellow and orange marker, crayon and colored pencil in the house) and drew as many suns as our hands could handle. which turned out to be about fifty. in hindsight, we probably should've used sturdier paper and bigger, brighter markers but it was a spur of the moment kind of project and everyone knows spur of the moment projects are all about using what you have. spur of the moment projects are also all about momentum. 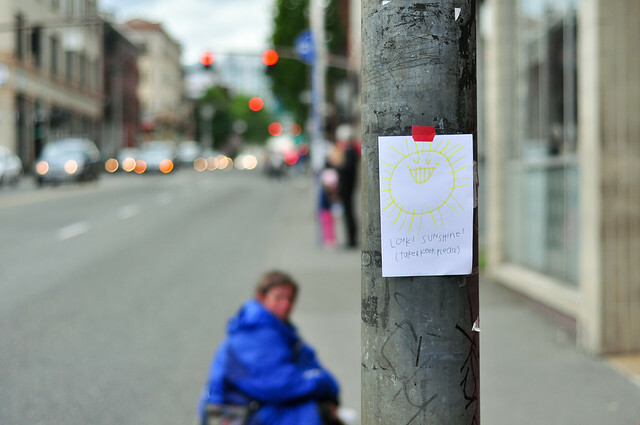 we packed up our sunshine flyers and our rolls of tape and took to the streets of portland, downtown portland. a signpost on burnside, just outside powell's books. and then the shelves of the self help section inside. 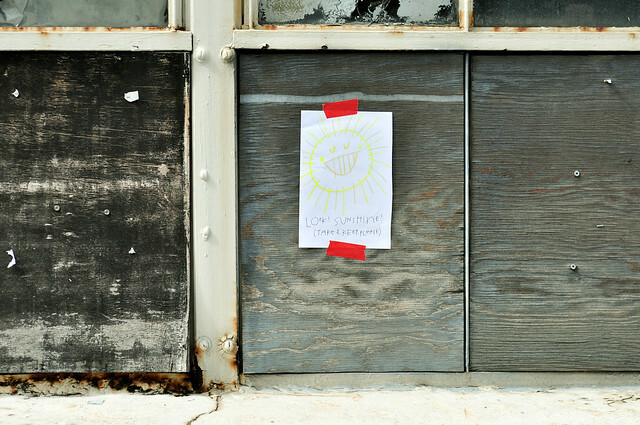 because if you are in the self help section of a book store, you might be a person who would appreciate a little sunshine flyer. 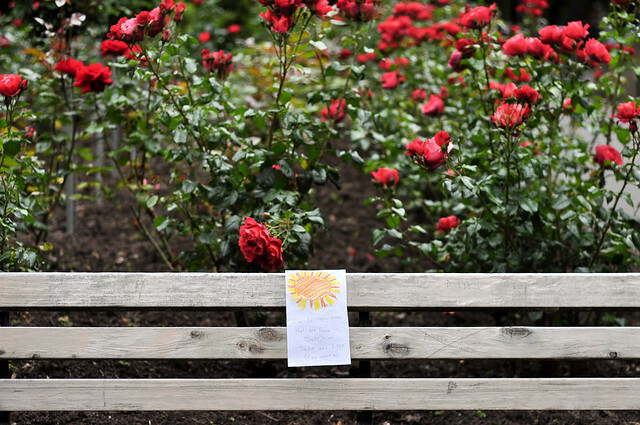 the park, near the rose bushes. rose bushes that greatly benefit from all that portland rain, I realize, but would also benefit from a little sunshine every once in a while. the bathroom of the lobby of the ace hotel. 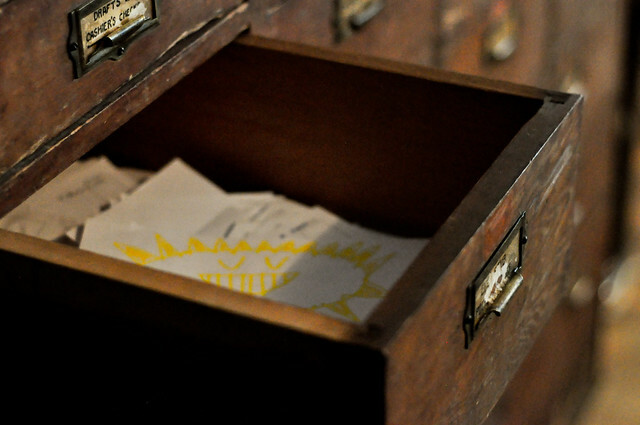 the secret drawers, where people leave all matters of notes, drawings and letters. 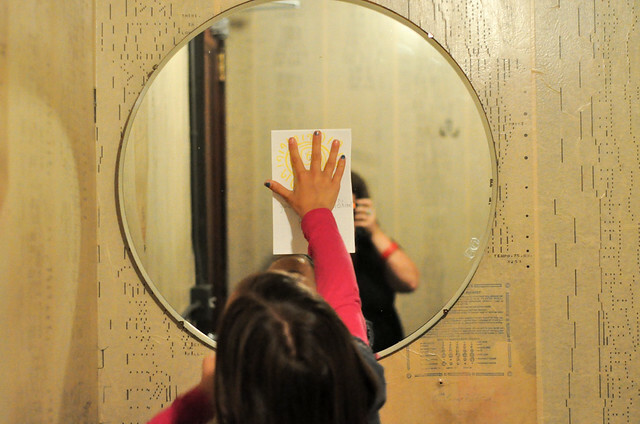 did you know the lobby of the ace hotel had secret drawers? well, they do. 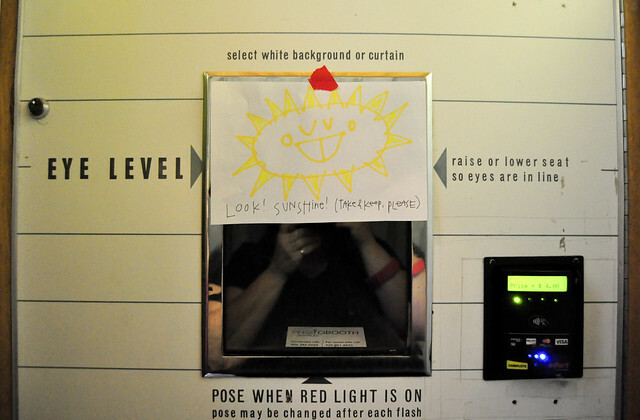 and then finally, the window of the streetcar on our ride back. 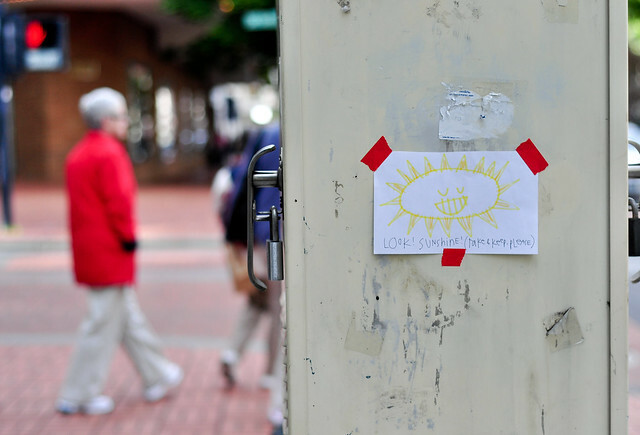 but maybe the best part of the story is this: a few days later, we drove around downtown to see if any of our sunshine flyers were still up. there were a few, though most of them were gone. but as we drove by a phonebooth where we'd intentionally covered up a horrible white supremacist sticker, we spotted a note. I jumped out of the car and the above is what I found. 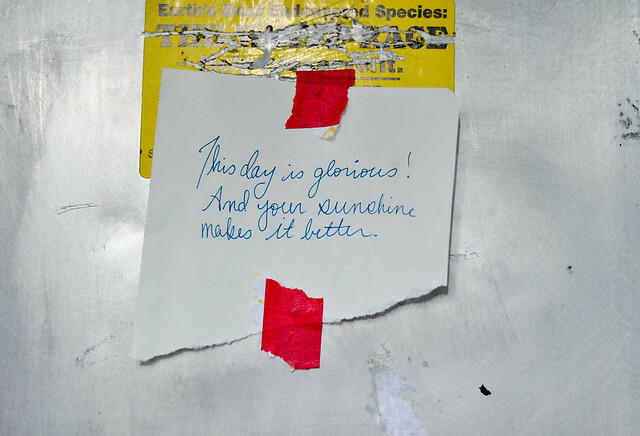 and so, on this rainy rainy day, this is something to remember, this note that was left for us. this is something to remember, this thing that we did. sometimes sunshine is not so much a big yellow ball in the sky but a state of mind. Amazing story and project! Heart-warming like a ray of sunshine! Aww, I wish I'd been there then to find and keep some sunshine! I love that kind of guerilla art. 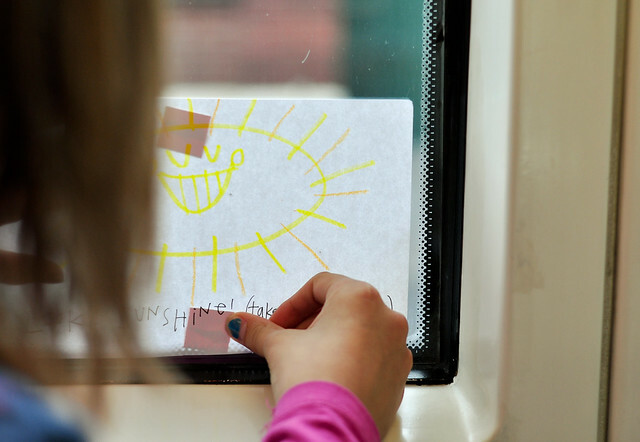 YOU are sunshine, my friend! this is so heartwarming. i can feel those rays!! I love this! You're right it is a state of mind (but the big yellow ball helps a little :)). this makes my heart sing. i love you and your delightfully sunny family! this is just so beautiful. what a wonderful idea! you are a wonderful family. May there always be sunshine in your life, Miss Hula! Just found your blog and because of this post I'm officially sold! Going on my daily reads immediately. 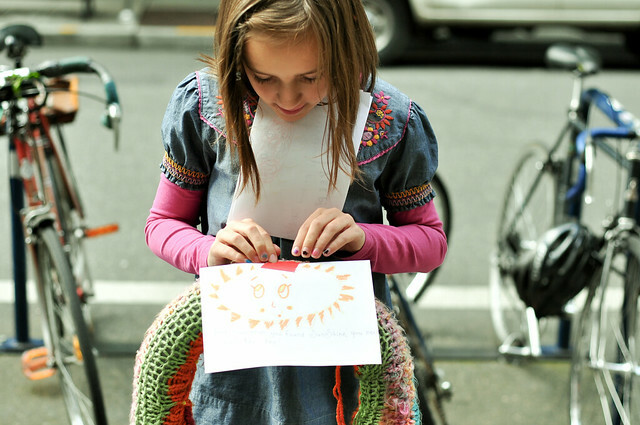 This is maybe the coolest family project ever. this makes me smile. thanks for the reminder that there are wonderful people in this world. your family is awesome! This may sound totally corny, but I got chills. Haha. So awesome :) I love that someone responded. That was the best part to me. 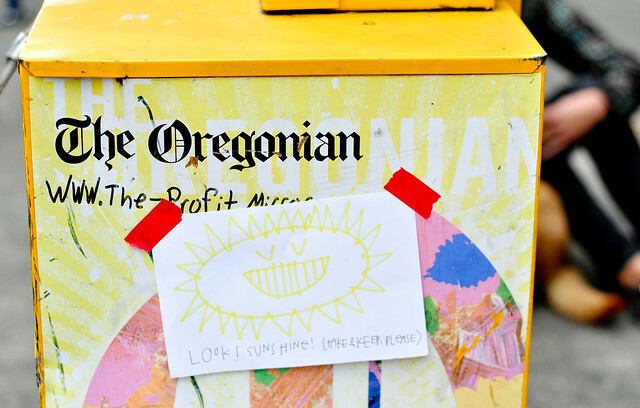 I ♥ Portland. aw i love this. i wish i would have found one of your suns. i remember that summer, i could have really used one! Will you adopt me? :) You're ridiculously awesome. we did something similar back in 2008.
and i miss your comments from time to time. enjoy! AWE-SOME!! This just brightened up my dark, grey and rainy Vancouver day- than again reading your Blog generaly does that to me, Andrea. This idea is fantastic but even better is that most of them were taken and that sweet note. Very cool! Spur of the moment projects are always so glorious! I quite like the note left for you guys, it makes the idea that much sweeter to know someone appreciates it. I wish I had one of those gorgeous suns stuck on the wall above my bed!! I love this. LOVE this. 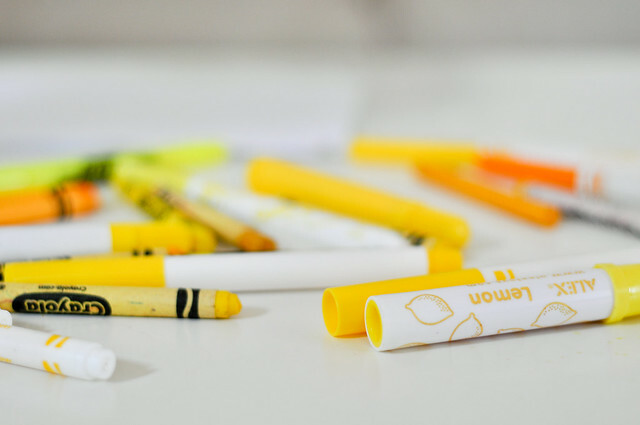 It gave me goosebumps & made my hands itch for yellow crayons & an optimistic little sidekick. Thanks so much for sharing your lovely idea! What a fantastic idea! I am itching for sun (and warm weather) here too. I love that someone responded. Goosebumps indeed. I love you guys! 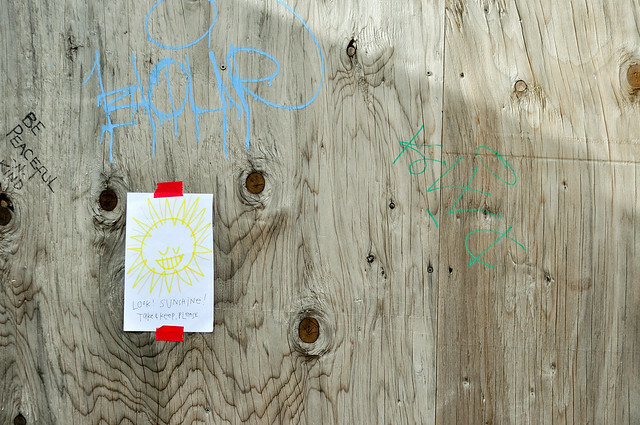 It's super cool guerilla-style sunshine art! omg! i welled up at the last sign that was left for you. what a perfect thing to do with your kids. love, love, love it. and your new banner is awesome, sweet hula. yep. i cried, too. you the bee's knees. That is the most awesome idea ever in the history of awesome ideas! so awesome that you went out and did this. seriously. What a beautiful idea, I'm so glad someone replyed to you too! hi dear! a friend of mine send me your post! Ah this is awesome!! Good for you!